The Intex Mariner 4 Inflatable Boat Set — an inexpensive but large and durable raft — offers the best bang for your buck that I’ve ever seen in an inflatable raft. 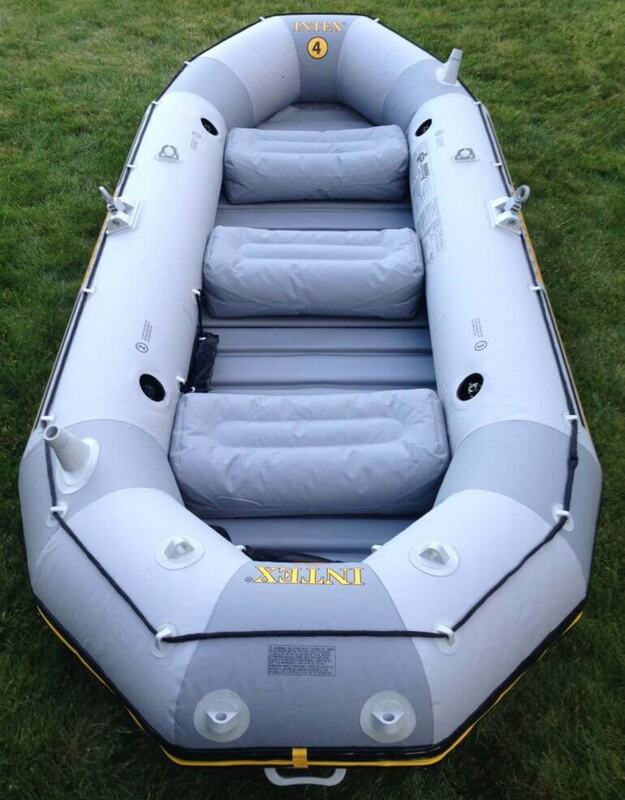 The Intex Mariner 4 is what I call a mid-quality raft. 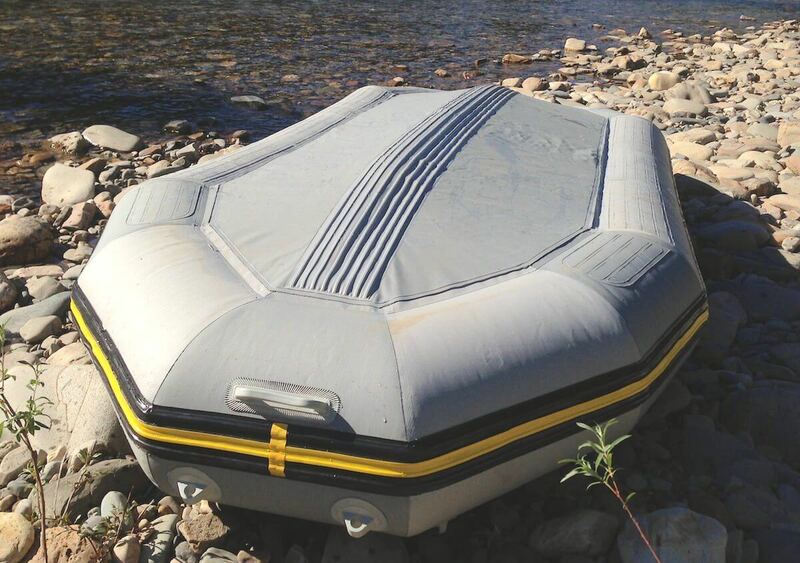 I wouldn’t trust the Intex Mariner 4 for whitewater rafting, but it’s also far more durable than the cheap little inflatables you can find all over the place. You can fish from the Intex Mariner 4 without worrying that a stray hook set on a missed fish is going to rocket your lure back at you and pop your boat. Plus, the Intex Mariner 4 has a packable-but-hard floor, which gives it a whole new level of stability for a raft that flirts with an amazing price point. Check Intex Mariner 4 pricing at Amazon. The oars included with the Intex Mariner 4 are better than most oars that come with competing inflatables, and the oar locks provide a good balance between maneuverability and stability. Combined with the hard-bottom system with an inflatable keel, I could row across a lake with a light wind surprisingly well. Oh, and on the maiden voyage, three people caught six trout. The Intex Mariner 4-Person Inflatable Boat is the best inexpensive raft I’ve ever seen. This Intex Mariner 4 is 57 inches wide, 129 inches long, and 19 inches high. It boasts an 880 pound weight limit, which means it can hold up to four 220-pound men. 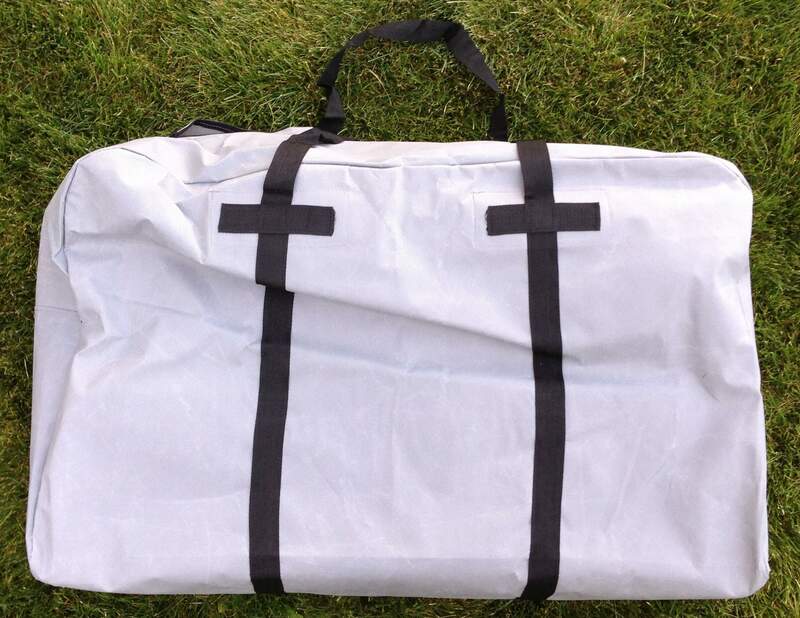 It uses a three-layer heavy-duty vinyl that is not as tough as what you’ll find on $5,000-plus whitewater rafts, but it’s far more durable than most of the low-end inflatables I see in sporting goods stores. It’s got quick-fill and fast-deflate Boston valves for all four of its main air chambers. It has an all-around grab line, an electric motor mounting point and an available Intex Motor Mount Kit, and it’s certified by the National Marine Manufacturer’s Association (NMMA) and is a U.S. Coast Guard approved vessel. Underneath the keel, the boat features a heavy-duty bumper strip. I scraped the entire raft over a lot of rocks on the St. Joe River in Idaho one hot August day and it held up fantastically. I was surprised to see it barely scratched at the end of the 6-hour float trip. Overall, the Intex Mariner 4 is a surprisingly solid inflatable raft for the price. Check pricing on the Intex Mariner 4 — and the Mariner 3 — at Cabela’s. The Intex Mariner 4 is nearly 5′ x 11′ and holds 880 pounds. The Intex Mariner 4 comes with a hand air pump that let me completely set up the boat in less than 20 minutes. After you unfurl the thing, you’ll find a rolled up set of 1×4 synthetic boards covered and connected by vinyl pouches. When you unroll these boards into the bottom of the boat, they lock into place when you air up the sides, forming a rigid floor. Below this roll of boards is the inflatable keel. You can’t really use the Intex Mariner 4 without the hard floor, but then again, the hard floor is the key feature of the boat anyway. The Intex Mariner 4 comes with three inflatable seats, which fit snugly between the outer walls of the raft. It’s pretty easy to set up, really. The Intex Mariner 4 raft comes inside a carry bag, in which you’ll find the raft, the floor, the oars, and the pump. If you pay attention, you can fit it all back inside the bag even after you use it, which I found surprising. Unfortunately, the raft is relatively heavy and ungainly for one man to pack. Sure, I can do it and most manly men could do it, too, but why? I’ve got a better solution: Snag an extra-large duffel bag and split the load — the floor goes in one bag and the raft in the other. I use the Northstar 1050 HD Tuff Cloth Diamond Ripstop Series Gear Bag, and for about $20, it’s a perfect blend of durability and cost. Suddenly the boat is a breeze to load and pack. All-in-all, this inflatable raft isn’t made for whitewater and I wouldn’t want to count on the oars or oarlocks on any river that’s typically run with real whitewater rafts. And yet, the Intex Mariner 4 is surprisingly durable, versatile, and cost-effective. 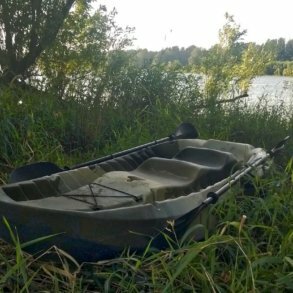 It’s a great leisure raft or simple fishing boat that you can actually throw into a car get out of the house with. You can fit the entire Intex Mariner 4 in the included carry bag, but it’s heavy. 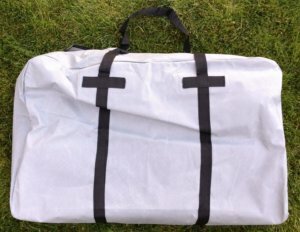 Get a second duffle bag to split the load. If you like the idea of a hard-bottomed raft and you’re on a budget, the Intex Mariner Four-Person Inflatable Boat is the way to go. Some guys have even outfitted the Mariner 4 with sailboat kits. You can’t beat the versatility and quality for the price. What if you want something a bit lighter with an inflatable floor? Try the Intex Mariner 3. It has a similarly tough construction. If you want something tough enough to handle a gas outboard motor and a little saltwater, try the Newport Vessels Baja Inflatables Sport Tender Dinghy Boat or the Seamax Ocean380 Inflatable Boat. And whitewater rafting? Check out any of the inflatable rafts at NRS. I have this same raft haven’t used it yet though. I read in the article that you did float a river with it. Did you inflate the keel or leave it deflated? I’m not looking to do any thing but flat floats on the green and upper Colo. Maybe take on class III but nothing worse! Would like advise on the boat also! I inflated the keel and would do it again — unless maybe I had a lot of very shallow water to deal with. On the middle part of the St. Joe River in Idaho (not the whitewater part in spring runoff) the boat held up great. Flat water with no crazy powerful currents and dead trees and logs to worry about, I would personally not hesitate to go with this boat based on my knowledge and skills. Class III would be iffy depending on your skill and experience. The bigger concern isn’t so much the strength and size of the boat — it’s the oars. While the oarlocks and oars are tough for this class of boat, compared to a whitewater raft, they are too short, small, and don’t let you really lean hard into them when you’ve got to row hard to get the boat into position for a bigger rapid. Possible? Yeah. Safe? Sometimes, not always. Hope this helps. 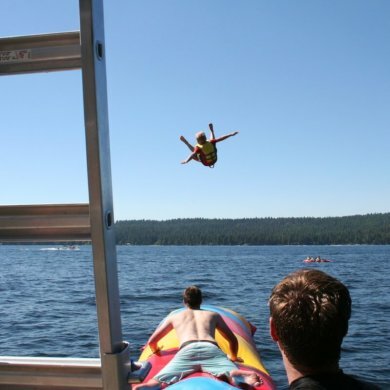 And get the boat in some softer water and try it out! Sounds great thanks for the feed back!! Chris, thanks for the review. I had been considering the Mariner 3 because of the weight and when you mentioned using two bags, I slapped myself alongside of my head. Duh! Of course what a great idea. I couldn’t see the trees for the forest. Do you know how much the floor weighs? I am getting up in age and I have to watch the old back. I just dragged the bag out of storage just for you — the floor alone weighs about 28 pounds. Thanks Chris. That helps me a lot. With the floor separately it appears the naked boat weighs about 45 pounds. I can handle that. Excellent. If you move the paddles, pump, and seat cushions to the bag with the floor, you can even out the load even more by about 5 pounds in the other direction. I’m considering this boat for a fishing raft for me and my sons. The river we’d fish on has a rocky bottom so we’d be disembarking on rocky surfaces more often than not…how durable is this boat? Should I worry about it ripping during a normal load/unload on a rocky shore? If it’s mostly going to be round river rock, I wouldn’t think twice or worry much about it — it’s a pretty durable material, plus the keel is lined with a heavier vinyl-type material. As for sharper and rougher rocks, I’ve scraped the bottom while rafting some rivers with light rapids — and haven’t damaged it at all. A couple of times I was worried, but after pulling out of the river, no holes! 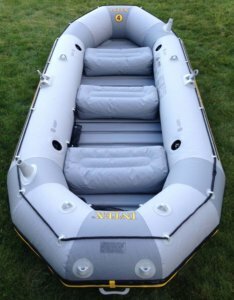 Personally, at this price point, this raft is surprisingly great — not as good as something costing a couple thousand dollars, but it’s better than the price would have you believe. So, let me put it this way: the raft is pretty tough, but rocks are rocks — stay away from sharp, jagged ones! Do You Need a Waterproof Camera in the Age of the Smartphone?